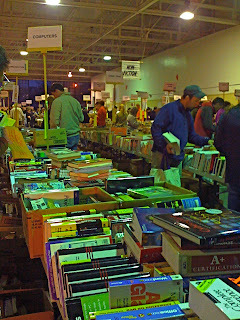 The book sale was a trip; it's going on all weekend, and well worth visiting. Paperbacks, many of them brand new, unread donations, are 50 cents each. Trade paperbacks and many excellent hardbacks are just $1. There is also a Better Books section and a Rare Book section, both with extremely reasonable prices. I bought lots of foreign mystery and some science fiction collections, along with a few novelty items and a collectible, signed James Blaylock novel.